The Drop-In is our unique design. This hammock stretches all the way across the Tower, The Abode, the Explorer, Ferret Nation or The Savic Royal Suite. It acts as a hammock, an additional shelf and a fall breaker. On one edge in the middle is a drop-in hole, where your rats can go and snuggle in the smaller hammock beneath. Our rats love theirs, hopefully yours will too! The underside side is navy fleece topped with soft , cream sherpa and is fitted with sturdy webbing straps and swivel clips. 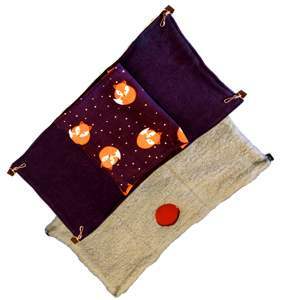 The lower deck is a double layer fleece hammock in our beautful sleepy fox print, lined in plain bright orange. Measures approx. 31 x15in (79x38cm) excluding clips.